Call today to schedule your personal consultation and tour! N E W LO C AT I O N ! PLANNING & COORDINATION Forever Borrowed assists couples with planning and coordinating all the details of their wedding. They provide day of or full wedding planning services. DECOR RENTALS Don't stress and buy all the décor for your event. Forever Borrowed sets special days apart with an ever-growing amount of statement pieces. Pieces can include vintage sofas; settee and paired chairs; glassware such as champagne flutes and water goblets; table top décor like centerpieces, lanterns, candleholders, flower vases; custom signage; and more! FLORAL DESIGN Forever Borrowed takes a modern approach to floral by working one-on-one and catering to each couple’s style and vision for their wedding day. They create stunning and unique floral arrangements including bouquets, boutonnieres, and table arrangements. About Us Forever Borrowed, a husband and wife team, is an event planning and coordinating company serving OKC and surrounding areas. Their passion is to customize and inspire unforgettable events by pairing vintage finds with modern twists to make dream events happen! This "Bohemian meets Morocco" shoot was inspired by the precious gems of the earth which create a vivid and playful color palette. Bright fuchsias, vivid greens, earthy yellows and deep plum were found in the floras, table ware, and furniture. Gold accents were found in the little details: hair loops, table settings, candle sticks, and stationary/calligraphy. The Glass Chapel is nestled perfectly into the quiet woods of Broken Arrow and the perfect location for a romantic, bohemian wedding because of its secluded, woodland environment. Various outdoor locations offer an array of areas for different aspects of your wedding and for photography purposes. The arches of the chapel and natural light from all the windows allowed for the woodlands to be seen and felt inside the chapel which brought the bohemian feel through to every aspect. The natural elements of this shoot felt peaceful and playful all at the same time which reflected the couple's personalities. 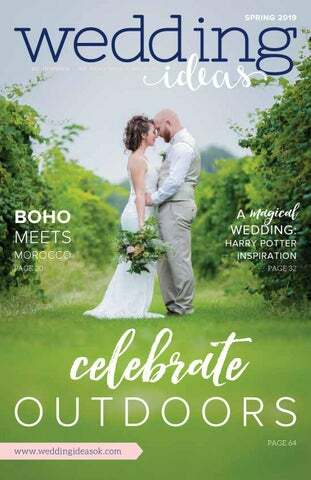 stay inspired Get our digital issue by texting OKBRIDE to 33446 and on our website weddingideasok.com. "Austin and Hailey are definitely Harry Potter fans! Their wedding and ceremony incorporated the Harry Potter theme. The gorgeous bridesmaids dress colors even represented each of the four Hogwart Houses.The coupleâ&#x20AC;&#x2122;s special day certainly was a wintry and very magical day!" "Aaron and Meghan are the most laid back people I have ever met, and their wedding at Majestic Pines was nothing short of a good time. Meghan’s mom made the bouquets, reception table decor, sweetheart table, memory table, Photo Booth, the pearly shoes, and more! After getting ready the couple chose to do a ‘first look’ moment. We then made our way to the ceremony where each shared a special hug with their mothers before the wedding officiant, John T. Snelson V, declared the couple husband and wife. After the ceremony, Meghan and Aaron danced the night away to "One Woman," by the Randy Rogers Band. Their genuine personalities were seen throughout their wedding photos–that's what I think love looks like." BEAUTIFUL VENUE Sitting on five acres of beautifully landscaped grounds, Creekside Chapel & Gardens can accommodate 200 wedding guests during all wedding services. FEATURES Features of Creekside Chapel & Gardens include a curved staircase, a hand-scraped hardwood dance floor, a remodeled Reception Hall & Bridal Room, chandeliers, snack bars, and our 'Tunnel of Love' leading to our Juliet Balcony for a Grand Entrance. Gorgeous linens and centerpieces are available. And after the celebration our Limo will whisk the newly wedded couple away! Couples and guests can enjoy our food and beverage options. A professional bartender will be provided. With plenty of room for your bridesmaids and family members, youâ&#x20AC;&#x2122;ll get ready in style and comfort. Our Bridal Room has plenty of room for your family and bridesmaids, lots of closet space, and a large make-up area with granite countertops, large mirrors...and plenty of outlets! OUR LOVELY GARDEN Step out into our lovely garden to have beautiful photos of the bride, groom and wedding party captured. A grove of trees, a field of green, an arbor, and fountains provide the perfect backdrop for any wedding day gallery. SCHEDULE A CONSULTATION Our pre-arranged packages include everything needed to enjoy a dreamy wedding. Our wedding coordinator is a creative, detailed and experienced professional. She and our fantastic staff love helping couples enjoy their memorable day. The best kept secret in Oklahoma is out! "Jaret and Virginia's wedding was absolutely stunning! They chose to support small local companies (Common Wealth Urban Farms OKC, Fancy Cakes & Confections, DJ Lennon Bramlett, Hair by Memory at Salon Exclusive, Big Truck Tacos, Officiant Lilly Dale Reed) which made the experience much more personable and each vendor's attention to detail was noticeable. The gorgeous green vineyard at Canadian River Winery made an amazing backdrop. The glowing sunlight peeking over the trees really set the tone for a beautiful ceremony. You could truly feel the love surrounding Virginia and Jaret as they said, 'I do.' The new family of three was glowing throughout the rest of the evening as they celebrated with their family and friends." This Directory, in part or whole, is not to be reproduced or copied without written permission. 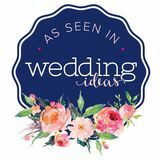 Wedding Ideas is a trademark of Hidden Values, Inc. 214-559-7283 Wedding Ideas of Oklahoma City cannot be held responsible for advertising services.